From changing a light bulb, servicing a fleet of vehicles to a full engine rebuild, Fairfax motors are the family run garage that can be trusted to competitively deliver an excellent service. 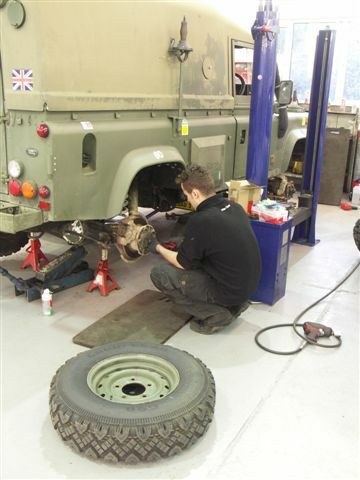 Fairfax Motors can deliver a whole range of technical services including engine diagnostics, servicing, MOT, tyre and exhaust supply and fit, specialist chrome and alloy welding, cam belt replacement, electric fault finding and repair and much more. Fairfax Motors opened its doors in 1992 and remains today as it was at the beginning, a family run garage offering excellent general and bespoke maintenance and repair services. Founders Roz and Mike Lingard started the business on Fairfax Road, hence our name, but relocated to our present base in Pownall Crescent which at the time was known as Crescent Garage, and we have now been here for the last 20 years. The family business is now run by James Lingard, Roz and Mike’s son, and continues to go from strength to strength, adapting to the increasing complexity of the modern car with the introduction in 2010 the capability to run complex engine diagnostics, while still catering to the bespoke needs of our customers both in the private and corporate sectors. The Team you will find today at Fairfax Motors is a friendly, helpful and knowledgeable one that will deliver unrivalled service and customer care. We offer a full range of garage services to vehicle owners located in Colchester area. All mechanic services are performed by highly qualified mechanics. We can handle any car problem. We use the latest manufacturers software detailing all vehicle makes and models their servicing requirements at various mileages and ages. We can certainly send reminders for servicing although we do not like to be pushy. A reminder sticker is placed within the vehicle with a service reminder based on mileage or time, along with your MOT by date. To be old fashioned we do also send out reminders for your MOT via the postal service.